Persian mathematician, astronomer, and poet who, on the accession as sultan of Jalal ad Din Malik Shah, was appointed astronomer royal. Other leading astronomers were also brought to the court observatory in Esfahan and, for 18 years, Khayyam supervised and produced work of outstanding quality. During this time, Khayyam led work on compiling astronomical tables and he also contributed to calendar reform in 1079. He measured the length of the year as 365.24219858156 days, which is incredible on two accounts: first that anyone would have the audacity to claim this degree of accuracy (we know now that the length of the year changes in the sixth decimal place within a lifetime) and second that it is astonishingly accurate. For comparison, the length of the year at the end of the 20th century was 365.242190 days. Ghyath al-Din Jamshid Kashani was born about 1380 CE in Kashan, Iran and died on 22 June 1429 in Samarkand, Transoxania (now Uzbekistan). At the time that Kashani was growing up Timur (often known as Tamburlaine) was conquering large regions. He had proclaimed himself sovereign and restorer of the Mongol empire at Samarkand in 1370 and, in 1383, Timur began his conquests in Persia with the capture of Herat. Timur died in 1405 and his empire was divided between his two sons, one of whom was Shah Rokh. While Timur was undertaking his military campaigns, conditions were very difficult with widespread poverty. Kashani lived in poverty, like so many others at this time, and devoted himself to astronomy and mathematics while moving from town to town. Conditions improved markedly when Shah Rokh took over after his father's death. He brought economic prosperity to the region and strongly supported artistic and intellectual life. With the changing atmosphere, Kashani's life also improved. The first event in Kashani's life which we can date accurately is his observation of an eclipse of the moon which he made in Kashan on 2 June 1406 (He dated many of his works with the exact date on which they were completed.). 8 کاربر مقابل از رخساره روشنی عزیز به خاطر این پست مفید تشکر کرده اند. Persian nobleman and astronomer, also known in the West by the Latinized name Azophi, who lived at the court of the Emire Adud ad-Daula and carried out observations based on Greek work, especially the Almagest of Ptolemy. Al-Sufi's The Book of the Fixed Stars (Kitab al-Kawatib al-Thabit al-Musawwar), published in about AD 964, includes a catalogue of 1,018 stars, giving their approximate positions, magnitudes, and colors. It contains Arabic star names that, in corrupted form, are still in use today, and the earliest known reference to the Andromeda galaxy. Al-Sufi also recorded and named a southern celestial feature al-Baqar al-Abyad (the White Bull), which today we know as the Large Magellanic Cloud. The Book of the Fixed Stars remains an important source of historical information in studies of proper motion and long- period variables. Before the invention of the telescope, the Danish astronomer Tycho Brahe revolutionized astronomy by establishing the importance of accurate observations. He invented an improved sextant and used it to make precise observations of the positions of stars and planets. Brahe completely recalculated Ptolemy’s astronomical tables, which contained many errors, and catalogued over one thousand stars during his lifetime. He built Europe’s first observatory and taught the art of observation to a generation of astronomers. In 1572 Brahe made careful observations of a “new star” (actually a supernova) that appeared suddenly in the constellation Cassiopeia. He showed that the object was not in the Earth’s atmosphere but was actually beyond the orbit of the moon. This discredited the prevailing theory that the heavens are static and unchanging. Armed with Tycho Brahe’s very accurate observations of the planets and his own painstaking measurements, the German astronomer Johannes Kepler discovered what we now call Kepler’s laws of planetary motion. These three laws precisely describe the motions of the planets around the sun. Kepler’s first law states that planets move in elliptical orbits around the sun. This overturned the ancient dogma that the planets move in perfect circles. His second law describes how a planet travels faster in its orbit when it is closer to the sun. The third law describes how the orbital periods of the planets increase with the size of their orbits. Kepler’s laws were based on the Copernican view of a heliocentric universe. Newton relied on them when he developed his more general law of universal gravitation. The German physicist Albert Einstein revolutionized our concepts of space and time with his theories of relativity. E = mc2, where c is the speed of light. Persian mathematician and astronomer who was the first to describe geometrical constructions possible only with a straightedge and a fixed compass, later dubbed a "rusty compass," that never alters its radius. He pioneered the use of the tangent function, apparently discovered the secant and cosecant functions, and compiled tables of sines and tangents at 15 arc-minute intervals – work done as part of an investigation into the orbit of the moon. Georges Lemaître, a Belgian cosmologist and Catholic priest, was one of the first scientists to use Einstein’s general theory of relativity to describe the universe as a whole. In 1927, he showed how the expansion of the universe, observed by Hubble, was a natural consequence of the equations of general relativity. Lemaître also thought about the expansion of the universe in a radically new way. If we could imagine tracing the expansion backward in time, we would see it getting smaller and smaller. Wouldn’t there be a limit to how small it could get? In 1931, Lemaître proposed that at some point in the distant past, the universe was compressed into a tiny object which he called the “cosmic egg.” This cosmic egg would have exploded—launching the expansion of space itself that we still see today. This theory later became known as thebig bangand provided the first scientific description of how the universe began. 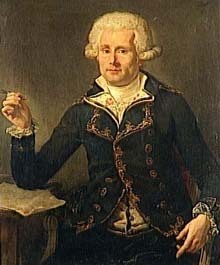 French astronomer famed for his list of more than 100 bright deep-sky objects, now known to be a variety of nebulae, star clusters, and galaxies . Principally a comet-hunter – Louis XV called him the "Comet Ferret" – Messier compiled his list of other fuzzy-looking objects so that he and others wouldn't keep confusing them for comets. Little is known about him prior to his joining the Paris Observatory as a draftsman and astronomical recorder. His interest in comets stemmed from the return of Halley's comet, which Edmond Halley predicted would take place around the beginning of 1759. Messier sighted its return on Jan. 12, 1759, an experience that inspired him to search for new comets for the rest of his life. (Although he is attributed with being the first person to re-sight Halley's Comet on French soil, the German amateur astronomer Palitzch is believed to have been the first of all to see it, on Christmas Day, 1758.) His final comet tally stood at 15 unique discoveries and six further co-discoveries. The compilation of his famous catalogue began in about 1760 and took more than two decades, during which time he used a variety of telescopes, including a 6-inch reflector and a 3½-inch refractor.